I made this cake for a friend’s daughter Kaylee’s 3rd birthday party this last weekend. It consists of a 6 inch double layer funfetti cake filled with strawberry butter cream filling and a 10 inch fudge marble cake filled with chocolate fudge filling and then iced with pink butter cream frosting. 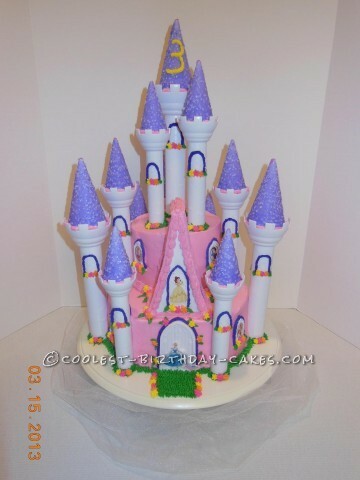 I purchased the Wilton Castle Cake set and Disney Princess stickers for the windows and doors. I iced the turrets using cut out cookie icing so it was smooth and then sprinkled them with sugar to make them sparkle. The rest of the flowers and details were done with rose, purple, orange and green butter cream decorating frosting and star, leave and grass tips. I also put white netting around the bottom to look like a cloud.